NEW YORK, New York — The Armenia Fund is currently implementing several revitalization projects in Shushi, aiming to refurbish infrastructure; renovate streets and apartment buildings; restore or build public institutions such as libraries and schools; and strengthen the healthcare sector. Of the seven apartment complexes in Shushi City slated for reconstruction, to date the Fund has completed roof work on three. These are the No. 9 Building on Amiryan Street, No. 21 Building on Garegin Nzhdeh Street, and No. 8 Building on Azatamartikneri Street. The roofs of all three buildings have been replaced. The renovations include installation of metal tiles, repair of air-conditioning and smoke ducts, and installation of new gutters and water-disposal pipes. Presently the fund is implementing roof-reconstruction projects on two other apartment complexes: the No. 57 building on Ghazanchetsots Street and the No. 7 building on Amiryan Street. In the meantime, a number of major infrastructure initiatives are underway. Already, foundation work on Ghazanchetsots Street has been completed and a water pipeline has been installed. In addition, the old electrical transmission lines have been replaced with a ten-kilowatt system, and currently crews are building decorative walls as part of a street-beautification project. On Hakhumyan Street, a new sewer system is being installed. Still another infrastructure project being implemented by the Fund in Shushi is the construction of an inner potable-water network as well as a sewer line. Access to safe drinking water has long been a key issue in the region. Until now, water flowing through rusted, obsolete metal pipes was not only unsafe for drinking but failed to reach all districts due to frequent pipe ruptures and considerable water loss. All of these initiatives are made possible by contributions made during the Fund’s 2009 benefit dinner held in Moscow. The Fund’s extensive revitalization program includes the refurbishment of a number of public buildings and the construction of new ones. In process today is the complete renovation of Shushi City’s Central Library, a project sponsored by the Armenia Fund’s U.S. Western Region. After years of languishing in a state of disrepair, the new, state-of-the-art library will meet all requirements for preserving books and is expected to become a community hub for research and learning. With preparatory work completed, crews are now building a new roof and reinforcing the building. Within its framework of strengthening Artsakh’s healthcare sector, the Fund’s Argentine affiliate has recently donated three ambulances to the Ministry of Health. One of these vehicles has been provided to the Shushi City Hospital. “More than 50,000 Armenians from throughout the world rallied around the ‘Our Shushi’ slogan and the ambitious, far-reaching program of reviving the city,” says Ara Vardanyan, executive director of the Hayastan All-Armenian Fund. While the Fund continues to implement a cluster of projects in Shushi, several others are now at the design or tender stage. Designs for the renovation of the Shushi City Cultural Center and the Muratsan School have been rendered and the projects are now being tendered; the construction of an orphanage is being designed; tenders have been announced for the reconstruction of the Abovyan School and construction of a medical clinic in the Mets Shen Village (Shushi Region). Located ten kilometers south of Stepanakert, the Shushi Region comprises Shushi City and seven rural communities. The region has an area of approximately 600 square kilometers and is home to 5,126 people, 3,867 of whom live in Shushi City. 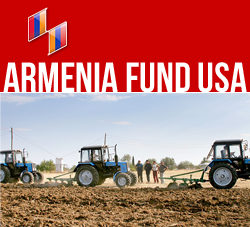 While farming and animal husbandry are the main occupations, many residents have found temporary employment through the Armenia Fund’s numerous and ongoing construction and renovation projects.